Bookride: Aran Knitting. Alice Starmore, 1997. "What I found fascinating, having been a history major in a previous life, was her use of "primary sources" to make her argument that the Aran patterns originated from the experiments of one gifted knitter who took the Scottish gansey one step further. The "primary sources" that Starmore examines are Aran sweaters in the collection of the National Museum of Ireland. One of the most interesting parts of this book was her analysis of these pieces. For me, this book was worth buying just for the first 45 pages...Alice Starmore also provides the reader with two chapters of patterns of her own. One consists of "classic" Aran designs. These are absolutely gorgeous. The patterns are intricate and complex without being overwhelming and busy. The next chapter consists of sweaters using Alice Starmore's invention of infinite lines and Celtic knots to echo Celtic line art, such as the Book of Kells." 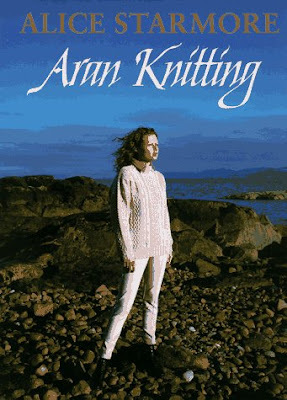 This reviewer is slightly less impressed by her chapter on designing your own Aran sweater, but possibly because what goes before is so excellent.